Incom has significant experience handling, selling, and servicing every brand of terminal on the market (and some not even on the market). Our experience with equipment and technology has led us to the conclusion that what is good for one Merchant is not necessarily good for another. Every Merchant is unique and every Merchant has different needs and different desires. We understand this and will custom-tailor an equipment package (either for lease or purchase) that meets your specific needs and which will fit your budget. We have found, nonetheless, that the Verifone Omni 3750 currently is the most versatile, advanced and effective terminal on the market. It is our favorite. VeriFone’s Omni 3700, with an integrated smart card reader, packs all the performance and processing capabilities you need into a compact, ergonomic “hand-over ” device that can be easily passed to customers for PIN entry. Convenient, all-in-one design combines a mag-stripe reader, smart card reader, internal PINpad, and quiet, fast thermal printer. This makes the termainal easy to instal and keeps your countertop clutter-free. With the Hypercom T7P, you get maximum features at a low price. 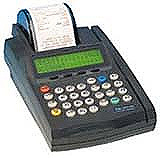 The T7P supports credit, debit, check and stored value card processing. Its integrated, modular printer is easy to maintain. The keypad makes training and everyday use a snap and the simple integrated design makes changing the printer module quick and easy. The T7P’s advanced communications features help shorten response times, lower costs and improve service. Regardless of your POS application, the Hypercom T7P is a winner when it comes to price-performance. The Hypercom T7Plus is designed for merchants requiring a compact countertop POS terminal accepting all magnetic stripe cards and delivering fast online transaction authorizations. The Hypercom T7Plus features the completely new SureLoad printer with significantly faster receipts delivery. Merchants and customers appreciate its quiet operation. Support for new smart cards and EMV-compliant software are both available, along with improved peripheral connectivity. The T7Plus delivers a powerful feature set in an attractive, compact design. It offers low overall cost of ownership thanks to its reliabililty, communications capabilities, easy operation and advanced remote software management. The T7Plus is the best choice for merchants wanting a new credit/debit card POS terminal. An advanced, and truly compact point-of-sale terminal housing a fast and extremely quiet built-in thermal printer supporting credit, debit, smart chip cards, electronic benefits transfer (EBT) phone cards and other electronically submitted transaction methods. In addition, check verification processing is handled easily and quickly. The large alphanumeric LCD display and menu driven software, in addition to its four “soft” keys and four programmable function keys, allow the user to easily and quickly access all of the terminal’s powerful features. This is always a great choice.